Bangs are incredibly cute, but they’re not for everybody. Before you decide on styling your hair in a manner that will change how it looks for a long time to come, consider the plusses and minuses associated with bangs. Shorter bangs are hard to camouflage or move out of the way while longer bangs might look better with some styles than others. 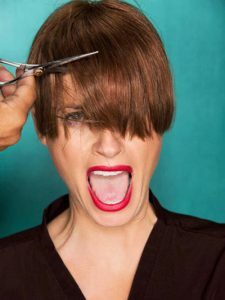 Choose whether or not you should have your hair cut into bangs by thinking about how you normally wear your hair, your head shape and what your everyday lifestyle is comprised of. Do you think that bangs would complement your layered bob well? Do you want bangs because your hair hasn’t been cut in five years and you think it would make you look different? Bangs can be blunt or asymmetrical, long or short or medium length. Getting bangs cut on a whim can be disastrous, so think about how you are going to wear them and also how long it might take to grow them out. Look at how you normally wear your hair, such as up in a bun, then consider what your face will come out looking like with bangs added to it. If you are the type of woman who likes to put your hair up in a ponytail and go, bangs might be too much for you to maintain. They’re simple and they can really help to frame a pretty face, but bangs also need to be trimmed and styled to look good. Sometimes bangs can look nice when you’ve got a short cut hairstyle but then they can also be too long and take away from all the other parts of your hair look. Get your hair cut to a medium length and get longer bangs that can be pulled back when you want to hide them. By keeping the hair at the front of your head a bit longer you can add and take away your bangs at will. 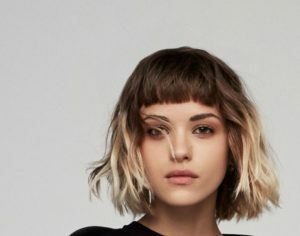 You can eventually decide on getting shorter bangs cut if you like the look, but you don’t have to be bound by a single styling choice either. Bangs or no bangs, your hair can be exquisite. A stylist can easily tell you if you will be able to improve your looks with bangs or not, so get a consultation to find out the truth. Talk to our stylists today about booking an appointment with the best NYC stylists in the industry.